This will be a bit of a rant, I am afraid. About a week ago I decided to start keeping a record of parts made for Harley Davidson motorcycles that don't fit, don't work and or are just plain shoddy. Believe me (and I am sure you do if you have ever worked on Harleys for a living) this is a constant, ongoing problem in this business. Lately I have had an absolute rash of junk parts to deal with. I have dedicated a 3 ring binder to this purpose and intend to keep a record of every part I come across that is manufactured incorrectly with the part number, application and manufacturer of the "junk part." It was really easy to fill up about 3 pages without going very far back in time. I am sure more of the parts I have "beat my head against the wall" about over the years will come to mind and be added as time goes on. Yesterday I had a four new entries for the book which cost me about a half a day of labor. These were parts that I paid good money for, which were incorrectly manufactured. And this was all just in one section of one motor. Usually the problem does not become evident until you are in the middle of an operation. Did I mention how frustrating this can be? Then to top it off, there are always the added problems. How many hoops will I have to jump through to return the part? Is every one of this particular part from this manufacturer defective? Is there any other source for the part? Can I make the part work with modification? How much time will I waste trying to get any kind of answer from the manufacturer? Does the manufacturer care even a little bit that they are selling junk? Yeah, a bit of a rant, but you should hear me when the circumstances are fresh. By the way, I titled the 3 ring binder "Book of Shame"
A week ago last Sunday our pastor recommended to the congregation that we read an approximately 2 chapter section of the book of Romans in preparation for an upcoming series of sermons. Somehow I managed to completely let it slip from my mind. Its not that I don't open the Bible during the week. The fact is that I read out loud from the Bible nearly every morning when my wife and I have our family devotions. But some how, some way, opening the Bible each morning did not remind me to read the passages in Romans. But then last Saturday morning, I noticed that my wife, Jane, had placed the previous weeks bulletin on the table with the verses we were to read hi-lighted. Thanks to her attentiveness, we were able to read the text during our Sunday morning devotions before church. A small thing, perhaps, but it sure brought to my mind how blessed that I am to have a wife that cares about such things. I pray that each of you is equally as blessed in this respect! I recently answered an email from a potential customer who was interested in having some performance work performed on his 95" Twin Cam, and had been shopping around, asking other shops for their input. One of the shops he contacted suggested keeping the stock valve size because a high lift cam and larger valve would lose bottom end torque. He had been led to believe that velocity would be greater with a smaller valve. He was also concerned with picking a different cam grind to replace his Screamin' Eagle 203 cams that would keep the low end punch he was used to. By the time I saw the length of my answer I realized I should just turn it into a post here on my blog. The following is most of my answer to him. There are more factors than lift and duration that effect how a cam performs. Higher lift by itself does nothing except allows more fuel/air in provided the heads flow more at the higher lift than they do at stock lift. Stock heads do not flow any more at .570" than the do at .500". Thus, a higher lift cam with the same timing specs would not give a performance benefit with stock heads. Duration does have effects on where the motor makes its power, but when the cam opens and closes the valve (timing events) can make a big difference. In other word two cams can have the same duration, but the timing of the opening and closing can be different giving different results. Many performance cams are designed such that they add top end power and take away some low end. They absolutely need more static compression ratio to make up for cylinder pressure lost to cam timing. Most cams in the .550" to .590 lift area fit into that category. They often loose a little low end, but make decent mid range power if the compression ratio is high enough. Other cams (such as those from Wood Performance) make huge torque numbers from combining a high compression ratio with cam timing that gives really high cylinder pressure. They tend to be hard starting and touchy about pinging because of it. The Kuryakyn cams are the only ones on the market that offer a third option. They make power throughout the RPM range, are easy starting and not prone to pinging. I know I am starting to sound like a Kuryakyn commercial, but trust me I have no stake in selling their product except that they work the best and so make my headwork look even better than it would with another cam. As for the larger intake valve loosing torque, That is only an issue if the flow does not increase enough to maintain or increase the velocity compared to the smaller valve. Velocity is a function of CFM and area. There are two places to consider the velocity. One is commonly called valve velocity and the other is port velocity. Valve velocity is calculated using the CFM and the diameter of the "choke" just beneath the valve seat. Port velocity is calculated using CFM and port volume (which gives an average port cross sectional area). The computer that is hooked up to my flowbench calculates both of these for each valve lift that I test. A good porting job will increase both of these velocities as well as the CFM for any valve size (within reason). Of course there does come a point where too large a valve will not increase flow and then the velocities will go down though the CFM may stay the same. In a Harley head with its extremely short intake tract, velocity is probably not as critical as in an engine with a longer one. It is the inertia of the intake charge that increases the volumetric efficiency by "overfilling" the cylinder. Inertia is a function of mass and velocity. With the mass of the charge limited by the short length of the intake tract, velocity becomes much less the critical factor it is with a longer one. I have to thank Mike Roland (the designer of Kuryakyn cams) for pointing that out to me. Sometimes the obvious just totally escapes me until someone points it out to me. That being said, my porting work invariably increases velocity. 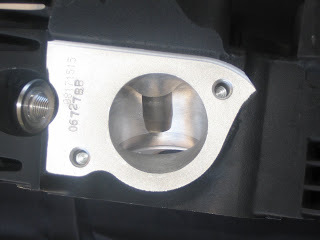 On the exhaust side, the smallest valve and port that will adequately evacuate the cylinder will work the best. At moderate RPM all of the spent gases will have been cleared before the cam gets into the higher lifts. 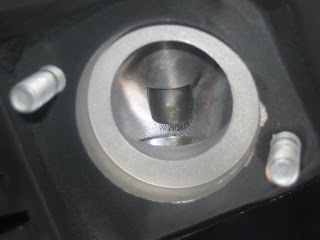 Larger exhaust valves and more high lift flow are needed for high RPM operation when there is not as much time available to clear the cylinder. For street use I like to keep the stock size exhaust valve. About a month ago my pastor asked if I would be willing to fill in for him bringing the message on Sunday, December 30, since he and his family would be out of town. I jumped at the chance; not that I am much of a preacher, but I do very much enjoy preparing a sermon. When I told my wife Jane that I would be doing the sermon, she suggested the subject of new beginnings, since it was so close to new years day. As a typical husband, I immediately rejected the idea. Then as a typical christian husband, I started to reconsider, and soon had an outline in my mind. Rather than post the entire sermon, I thought I would give a brief summary, because if you are like me, then the spare time you have available for reading blogs is pretty limited. Then we turned to Revelation 21: 1-5 and looked at another "new beginning"; the new heaven and new earth. At that time the earth will be returned to its former glory. It will be what it was before Adams fall, maybe better. Among the many other things that will be new in that new heaven and new earth, one great thing that will be new for us is that we will finally be completely free from sin! (Revelation 21:27) Isn't that what we are longing for? The third "new beginning" that we looked at was the new man as seen in 2 Corinthians 5:17 Therefore if any man be in Christ, he is a new creature: old things are passed away; behold, all things are become new. I stated that there should be some evidence of this new man. If all things have become new, there will be changes to your life. We turned to John chapter 3 and considered the fact that in order to enter the kingdom of God you "must be born again". We spent a little time looking at how we cannot see the new birth or its source, but we can certainly see and hear the effects of it as stated in John 3: 8. I stated that no matter what nuance there might be to a correct understanding of when and to what extent the kingdom of God has arrived, I was 100% sure that when the new heaven and new earth arrive, the kingdom of God will have been realized in its fullness. The new birth is a prerequisite to entering into that new heaven and new earth. I will end this with the same suggestions I ended the sermon with. As we enter the new year, if you are looking for some new years resolutions, then consider these: Spend more time reading the bible and contemplating God's word. Spend more time in prayer. Pray for your church more often. Pray for you pastor more often. I think this kind of "new year resolution" is the best kind.